The English language teachers, having realized that my door is always unlocked, that I am in the office about fourteen hours a day, and that I am by myself for about twelve of them, have decided that it is time for me, as I near the end of my trial stay, to learn all about Chinese culture. Biting back my cynicism, I agree. It is better to learn and enjoy than to wallow in self-pity and snarky observations. 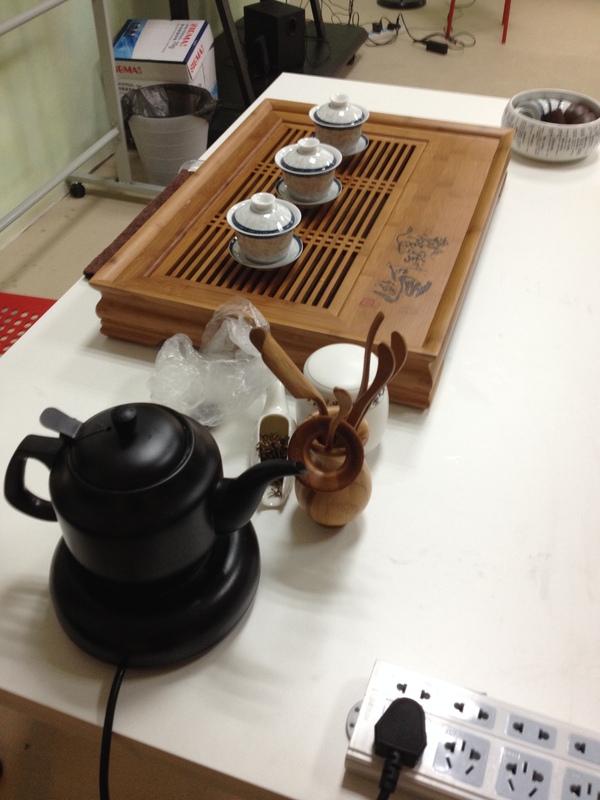 First, I learn about the Chinese tea ceremony. Erin invites the teacher who is in charge of teaching the tea ceremonies down to the office. The teachers arrange the desks and set out the tea tray, kettle, pots, cups, spoons, carafes, tongs and tea containers on the desk, creating a scene that would be beautiful on any other surface than a generic white IKEA desk. The tea trays are nifty little devices, with slatted tops and a bit of tube on the bottom, which allows for water and discarded tea to drain into a bucket on the floor. I don’t know the tea ceremony teacher, and she does not speak English. Luckily, I have five teachers who are eager to practice their translation skills. The school’s photographer shows up (I don’t know who the informant is), and immediately starts snapping pictures. Did you know that there are different ways of brewing different types of teas? For example, you put jasmine tea into the larger teacup, and use the lid to brush away the leaves when you drink. For oolong, you use the first infusion to wash both the tasting and smelling cups, and drink the following. Green tea is made in a tall clear glass so you can watch the leaves “dance.” I learned the basics of this when I was in Shanghai and went to a tea shop. There is something much more lovely about the ceremony. The teacher is the epitome of grace. After every motion she flourishes with her hands in a small arc. She only uses her fingertips to touch most things, even though the pots and cups are very hot. And each tea has its own ceremony and its own history. I like it much more than the store ceremonies, even though I know the teacher trains students for just that purpose. In the store, they push what each tea will cure – black tea for diabetes, ginseng oolong for detox, green for fighting cancer, etc. It’s not about the history, or the beauty or symbolism in the gestures – it’s business and sales and money. I respect that, but seeing a ceremony done simply for the ceremony is a far more enlightening experience. And by going slow and smelling and sipping, a tea ceremony is respectful of your time. It puts a value on your presence. There is no hurrying the kettle. You sit and drink, chat and wait, and become more aware of yourself and those around you. I found it to be incredibly relaxing, even though conversation was a little scattered because of the language barriers. The slow pace of drinking tea here and the small portions makes taking tea almost like tasting wine. There is much more character in the leaves than I would have thought, many more layers of flavor. I really like pu’er tea, a dark red tea that has a smoky taste. I also like oolong because one infusion can be smooth and light, the second infusion bitter and woody, and the third sweet and mellow. Oolong is the like the chameleon of teas. Green tea is a workhorse tea, though green tea with jasmine is floral and pleasant. The men who drive the pedal taxis have clear glass thermoses packed with green tea, which lasts them throughout the day. My “last a whole day” tea is buckwheat tea, with its sweet, earthen taste that smells of fields. At the supermarket (which I will write on later), there’s a buffet of tea options. Dried lemons, dried rose hips, dried flowers and fruits – it’s like a build-a-bear workshop, but with teas. You can see how tea is ingrained in their culture, their mindset. It’s served in place of water in the restaurants (though this is more because tap water is not quite potable unless boiled). I make tea at home with a kettle, and I will, on occasion steep leaves and take my time. I try to avoid using the microwave. I make my tea in a big coffee mug with a handle. I do not drink my tea delicately, though I do savor the taste. I drink my big mug of tea while I write, or do needlepoint. I tried having a glass tea pot for my flowering teas – twice, actually. Both times my family cracked them through disrespectful usage, and so I gave up delicacy in favor of thick ceramic mugs. It’s nice to pretend that I could drink tea from a cup which holds less than a shot glass, that drinking tea can be such a delicate, tiny affair. And don’t you fret, coffee pot – you are still my morning ritual. I decided to put one of my videos of the ceremony here – this is the making of jasmine green tea. I want to mildly apologize for the quality of this video – I took it on my phone and didn’t want to spoil the atmosphere by moving around. This Post was posted in Food and tagged Ceremony, China, Chinese Tea, Grace, living abroad, living in China, Meditation, Ritual, Tea Ceremony. Bookmark the permalink.